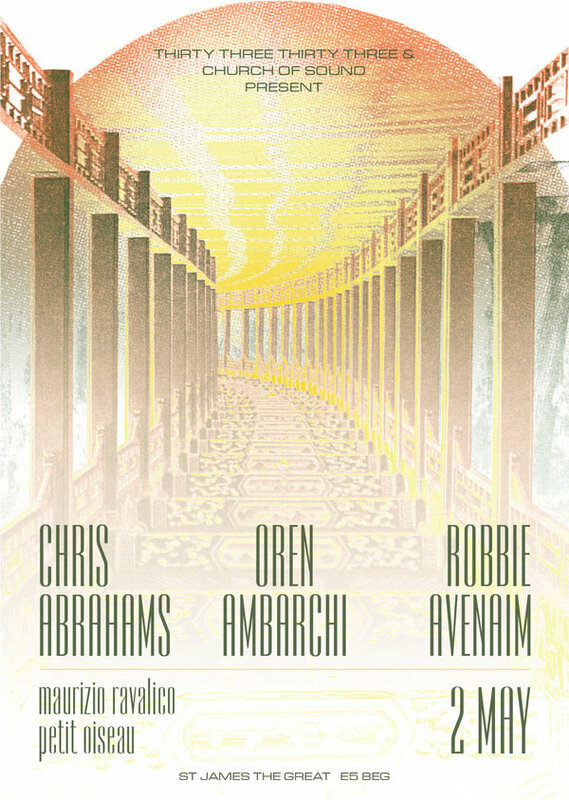 On Thursday May 2nd 2019, we are delighted to welcome Oren Ambarchi, Chris Abrahams & Robbie Avenaim for their debut UK performance of new and unreleased music. We will also be hosting a solo percussion set from Maurizio Ravalico and the second ever UK performance from Petit Oiseau. Oren Ambarchi is a musical polymath who has been releasing records like someone who prefers studio time to sleep. His work focuses mainly on the exploration of the guitar, his music existing in the cracks between modern electronics, improvisation and minimalism. His label, Black Truffle Records, soon to turn 10 years old, has to date almost 50 releases, featuring names like Alvin Lucier, Keiji Hano & Charlemagne Palestine. Chris Abrahams is today recognised as one of Australia’s finest keyboard players and is an integral part of The Necks, a slowjazz trio from Sydney with a propensity for longform pieces comprised of gradual, contemplative shapeshifting harmonic and rhythmic figures. Robbie Avenaim is a musician focussed primarily on percussion and instrument building, his practice mining the depths of free improvisation, combining traditional and extended techniques including the motorisation of certain percussive elements of his instrument. For this show he will be performing on an extended kit featuring, amongst other things, 3 x 22” kick drums. Visionary percussionist Maurizio Ravalico (Collocutor, Fiium Shaarrk, Dele Sosimi, ex Jamiroquai) will present a selection of music from his solo percussion album ‘Nobody’s Husband, Nobody’s Dad’. Entirely acoustic, with no playback devices, loops or electronic manipulations, Maurizio’s unique performance is a continuous unfolding of unearthly sounds, often generated by unexpected combinations of conventional instruments and found objects, both played using a mix of orthodox and extended techniques. Past collaborators include Jamiroquai & Paul McCartney. Petit Oiseau is a duo bringing together rare classical Indian string instruments known as the Dilruba and the Taus, unusually combined with an interest in alternate tunings and numerology through custom patches built on a E-MU Command Station digital synthesiser. Sounds are swollen, expanded and layered, steadily unfolding through time. On the decks we will have Lunch Money, a local experimental jazz outfit hot off the release of lunchmoneylife STYLES™, a compilation album in the form of a cereal box. We will be serving food from the start and, as ever, all proceeds from the booking fees will be going to charity via Party for the People.